Terror in Resonance, a Thought-Invoking Animation Series, for Japanese only? Where shall I start? Maybe from the name itself and the poster. I was spoiled before watching the series that it somehow involved a “nuke”, which is not really my fault cause it’s written in the “Synopsis” part of its Wikipedia page (though not the English version). But even if you are not spoiled, watching the first five minutes of episode one, with the protagonists stealing something from a nuclear plant should convey something similar. 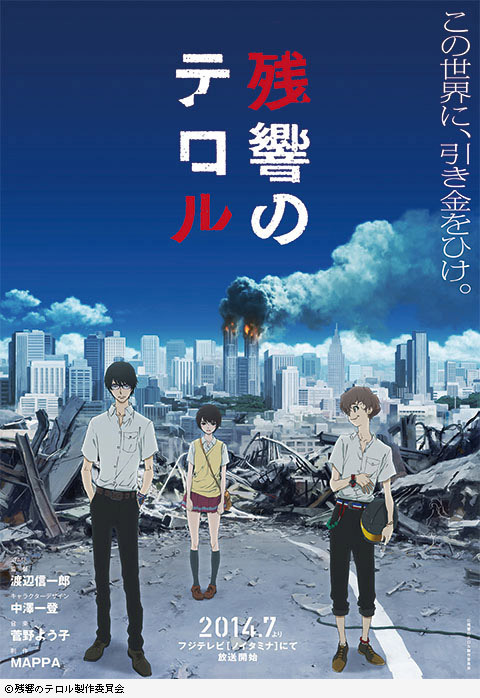 Thus by looking at the poster of three protagonists standing in front of twisted metals and buildings on fire, I naturally expected Terror in Resonance to be the story of three protagonists fighting for their lives in some post-apocalyptic world. Well, the skies are blue and some buildings are intact in the poster, so it might be a sanitized version of Mad Max. Well, the title says “Terror in Resonance”, in which the terror must be the nuke, and the resonance must be aftermath of the nuke. Unfortunately, I was proven wrong. On the surface, the story evolved around some terrorist duet blowing up buildings, for which authorities from certain countries with a mental age of five thought the series was glorifying acts of terror. Amazingly, this helped make my mind into watching the series as they usually sieved through works and banned the best from public views. A further look into the series revealed two runaways from some inhumane child drug test facilities going through lengths to expose their stories to the public, against entrenched political interests, drawing attention but causing no casualties. Sounds more interesting. And those entrenched political interests did those tests for the good of the country, in their opinion, as they saw Japan as a nation very much under American control, even 70 years after WWII. And this mindset of subordination was everywhere in the series. We saw there’s nothing the police chief could do with obviously questionable orders from his superior, we saw the female protagonist Lisa Mishima being bullied in school by her classmates, but most evidently, we saw the seemingly boundless power that America’s delegation wielded over Japanese authorities in the airport hunt, and the subsequent highway chase. I know it’s exaggerated, but it just felt too much, to either emphasize America’s control over Japan, or to shed light onto Five, another female protagonist’s mental state. And somehow, senior congressmen thought the best way to bring independence to their nation was to the development of some supernatural human (from orphans), as if superiority of one person, if they ever succeeded, would make Japan on equal grounds, if not better, than the States. For which, honestly, I think launching “Japan’s Got Talent” might be a better idea. Oh, yeah, alongside super-children, they were developing nuclear weapons, which, if you look at North Korea, you know nuclear weapons alone doesn’t make a country great. Of course this is not to say there’s nothing good about the series, in fact, there’s plenty. We were all familiar with stories of revenge, but the two protagonists didn’t use their revenge to right what was wrong, they merely sought a voice, where they could tell their stories which the public can contemplate on, and a nation instead of its few congressmen would think of a way forward. The brothers could easily kill all the officials in charge of their experiment, which was how justice was usually delivered in movies. They didn’t, they painstakingly made sure there wouldn’t be any casualties. So it was actually quite a marvelous plot. And for characters, I liked the uniqueness and complexity of the characters, so that even the two protagonist brothers that worked as a terrorist duet ultimately made opposite choices, one for their mission and another for his friend Lisa Mishima. But at the same time, the uniqueness and complexity got very well conveyed to the audiences, no obscurity. It’s just that there wasn’t much in-depth character building throughout the series, partly because this is only an 11-episode series, not much longer than a movie. Unfortunately, I’m not Japanese. When I was touring Japan this May, I saw a country with almost absurd self-discipline, of almost-untrue public security, of advanced infrastructure that’s unrivaled throughout the world, all the pleasant things a tourist can see. However, at the same time I very much believed that the Japan I saw as a tourist may not be the Japan seen by Japanese people. I heard rumors that Japan is a nation plagued by social problems, of stress in the workplace, of self-identity and stagnant economy. Well-dressed men in late night trains was as far as I can see during my trip about these problems. So maybe, the absurdity of such child drug test in the series may find perfect explanation among Japanese people, which I believed is what the series was intended for. And at the end of the series, Lisa Mishima, representing the Japanese masses, visited the tombs of the test children and hopefully, found a path forward. Unfortunately, the false expectation of nuke going off consumed much of my viewing experience, and there’s no way for me to feel that mindset as Japanese people. So to me, the series provided a refreshingly new plot, with clear set of characters. I know it had all the traits of a good series, I just cannot comprehend. Terror in Resonance, a Thought-Invoking Animation Series, for Japanese only? by Huang's Site is licensed under a Creative Commons Attribution-NonCommercial-ShareAlike 4.0 International License.